If you missed Santa's arrival in his horse-drawn coach, you can visit him and his elves every weekend in his Grotto until Christmas Eve! 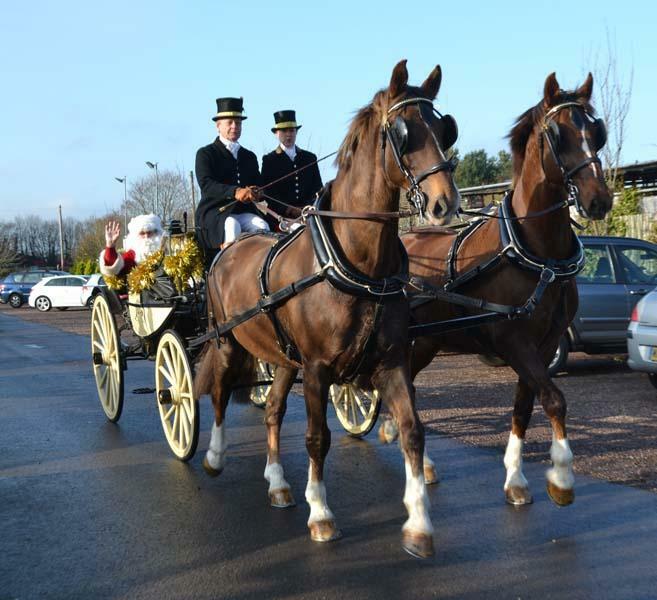 To give his reindeer a rest before the big day, Santa made a dramatic arrival in a horse-drawn carriage at the Harehatch Sheeplands Garden Centre on Saturday 26th November. There was delight and excitement in the crowd of children waiting to see him. He recruited a team of elves from the Inner Wheel and Rotary clubs of Reading Maiden Erlegh to help him with distribution of presents. Santa and his Elves will be at the garden centre every weekend from now on up to Christmas. Also from 3rd December he will be having breakfast at 9 am on Saturdays and Sundays at the Sheeplands restaurant with children and parents who have registered. During the Christmas week he will be in his grotto every day from Tuesday right up to Christmas Eve. Children can talk with him and tell him what they are hoping to get as presents. Each child who either has breakfast with Santa or meets him in the grotto will get a present.